Finding out about the public’s views on and interest in ethical, responsible, and impactful investment practices. The Department for International Development is holding a national conversation to find out more about the public’s views on and interest in ethical, responsible, and impactful investment practices. This includes investing in companies or sectors that make positive change in the world, like renewable energy. This also means avoiding investing in companies that do harm, for example, companies that employ child labour in the developing world. Everyone can play a part in ending poverty. Governments, charities, businesses, and people around the world are playing a role. The financial industry is developing products that aim both to create good financial performance and positive impact on the world. We want to hear from people in the UK about how they want to invest today to build the future of tomorrow. This conversation will include focus groups and events across the country, as well as a national survey. The results of the conversation will be published in the Autumn. This work builds on work government and industry have been leading to bring impact investment to the mainstream. Financing is a key component of delivering the Global Goals. 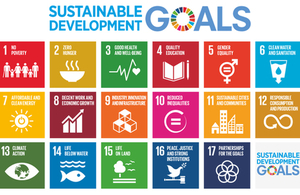 This year the UK is reviewing its progress through a Voluntary National Review towards the Sustainable Development Goals. Find out more about the National Conversation and how you can get involved. Read DFID’s Economic Development strategy.